This Guinness World Record holder has juggled everything from working video cameras to bowling balls that he can catch with his head. He has cut it up on every imaginable variety show, from “The Tonight Show with Jay Leno” to “Last Call with Carson Daily” to “The Donny and Marie Show,” where he kept himself from falling off his unicycle by leaning on Marie Osmond’s hair. 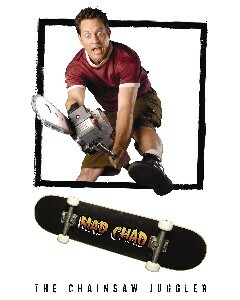 Mad Chad’s so unforgettable Sam Raimi gave him a role in “Spider-Man III.” He’s so good he taught Dustin Hoffman to juggle for “Mr. Magorium’s Wonder Emporium.” And he’s so powerful not even three 100,000 volt stun guns can stop him. Whether he’s performing his hilarious 90-minute show to sold-out crowds at performing arts centers, imploring boisterous college audiences to throw knives responsibly, or teaching Fortune 500 executives at companies like AT&T and Nissan to multitask using heavy-duty logging tools, Mad Chad Taylor may be the most dangerous man in comedy, particularly if you sit too close. Then again, those tend to be the really expensive seats.